A daily guest pass can be purchased at our Member Services Desk at any branch of the YMCA of Centre County. Another great reason to belong to the YMCA! The Y stands for healthy living and to make sure all members continue to be involved wherever they may travel or work, YMCAs across Pennsylvania have joined together to offer reciprocal membership through their “My Y is Every Y” program. As a benefit of a YMCA membership, bring your membership card and photo ID and enjoy free access to almost every Y in Pennsylvania. So get out and explore Pennsylvania and stay connected to the Y! Some restrictions may apply. My Y is Every Y participants must use their home branch at least 50% of the time. The YMCA of Centre County participates in the YMCA of the USA’s National AWAY Program (Always Welcome at the YMCA). 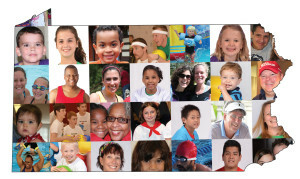 Our policy is to permit any member, in good standing at another YMCA, up to 12 visits per year. After 12 visits, a member from a participating YMCA will have the following options: purchase a membership or pay half the daily guest pass fee per visit.